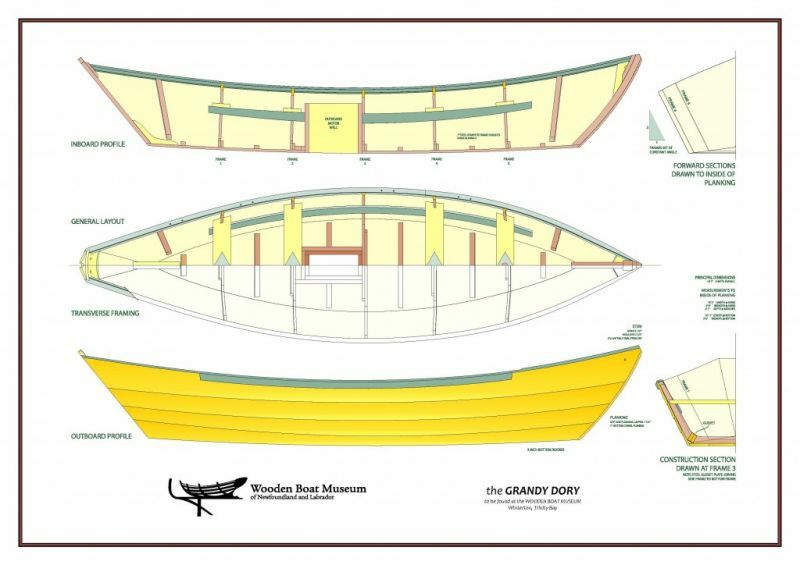 Stephen studied the design of these and other dories and then developed a boat which he felt better suited the Newfoundland fishery, weather and ocean conditions. His sons – Max, Roy and Leonard – joined him when he struck out on his own to establish a workshop building and selling his version of the Grand Bank dory. They built thousands of them over the years. The Grandy’s built their dories in the manner of a factory assembly line. They would make up to twenty five bottoms (generally fifteen feet long by thirty seven inches wide and one inch thick) and stack them in the workshop. Then four white pine planks were shaped. Gunwales, caps, counters and stems were sawn, dressed and set aside. As the builder assembled the dory he could quickly lay his hands on each component, set them in position and fasten with either galvanized boat nails or clinch nails. In the nineteen forties and fifties the high demand for dories kept the Grandy workshop busy. They met a production quota of two dories per day and sold each for ninety dollars. Stephen passed away in January, 1960. His son Roy continued building boats, while his sons Leonard and Max went on to building schooners at Marystown Co-operative Enterprise Ltd. – known locally as “the beach” – on the Burin Peninsula. The Grandy’s also went to Lunenburg to learn some skills in boatbuilding aswell. I am looking to get a forum. Do you know of any builders in Newfoundland who may be able to build one for me. Thank you. It would be great to be able to get a buy a set of plans for them. Did you get your plans? If not I can tell you what you need if you know the overall length that you would like to build. My husband makes Dorys. He has some three foot and four foot Dorys. They are made out of yellow and red cedar. He sells the three foot for $90 and the four foot for $120. All I want is a plan with a matetial list to build a plywood Portuguese dory. Can you provide with that? John Gardner made a book called the dory book and it has alot of offset charts within it pages for bank dory and others. Ahh the grandy dory, my first car. Loved that thing! It didn’t have wheels but it would get me from point-A to point-B just fine.